For the past few years our annual autumn pilgrimage has been to a National Trust property south of London, in which car park contains several large and very productive damson trees. 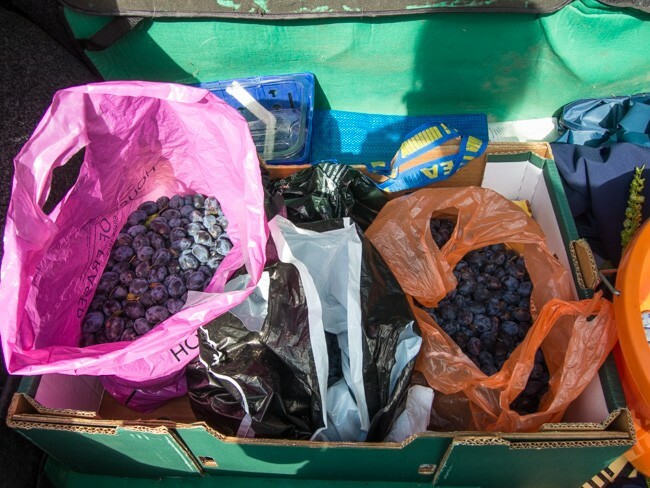 Every year we have visited the damsons have been left to rot and fall off so we don’t at all feel guilty filling a couple of carrier bags worth; call it membership benefits. The first year we found this secret source was quite by chance and we most definitely are going to keep it secret. This year I saw tiny trays of damsons in sale in Tesco for a horrendous sum. But I do wish there was somewhere closer to pick or acquire them. Damsons are a subspecies of plums; the fruits are smaller than typical plums with a tart sourness that when cooked makes the most delicious rich fruity flavour with a tang. One or two types can be eaten raw, including the ones we liberated which I think are ‘Merryweather’. Damsons were once widely grown, including in nearby Buckinghamshire, until falling out of favour post Second World War. Did you know that they were used to dye cloth and straw for hats and were used to produce the khaki green of uniforms in the First World War? 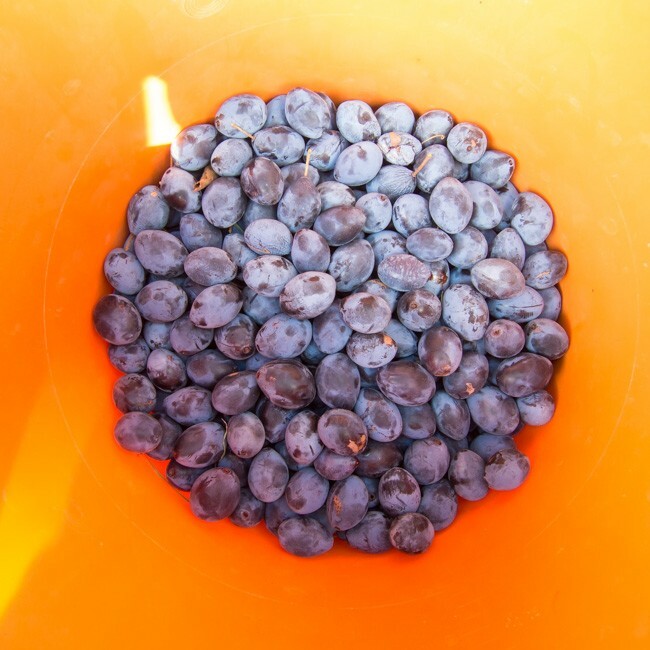 We use our damsons to make the most delicious wine, jam and jelly. 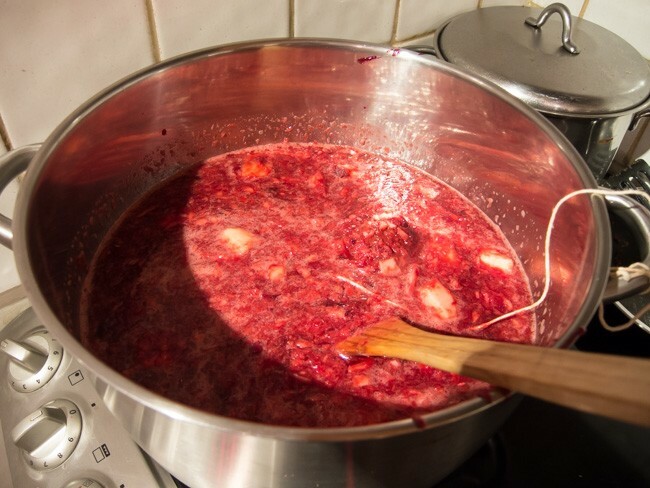 Because the fruit is high in pectin and acid, it sets very easily to make a delicious jam or jelly without additional pectin or lemon juice. The only pain is stoning them which is fiddly because the fruit clings to the stone so by far the easiest way, whatever recipe you are using, is to stew them first, mash with a potato masher, don rubber gloves and go fishing for the stones. Tedious but well worth it. The damson wine we made last year was the most successful of the homemade wines we have ever made and won me first place and a trophy at the local show. There are two fresh demi-johns on the go as I type this, bubbling away in the corner. There are numerous other ways of using this glut of fruit; damson ice-cream, damson crumble, damson gin, damson cheese, damson sauce (particularly good with gammon and game, like cranberry relish). This recipe is courtesy of the queen of cooking, Delia Smith. Stew the damsons gently with 250ml of the vinegar until very soft. Leave to cool then, wearing rubber gloves, fish out all the stones. Put the stewed stoned damsons into a large preserving pan. Finely chop the apples and onions (using a food processor is perfect) and add to the pan. Tie the spices together in muslin with string, drop the spice bag into the pan and tie the other end of the string to handle of the pan. Bring to the boil and reduce the heat down so the pot gently simmers away for 3 to 4 hours. 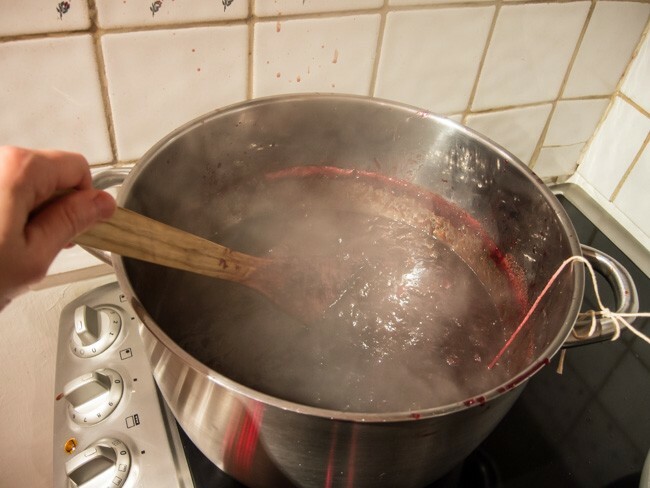 You need to stir fairly often and almost continuously for the last couple of hours because like all chutneys it tends to stick to the bottom of the pan – you don’t want burnt chutney. You will know the chutney is ready for potting when a channel drawn across the top stays in place for 5 seconds or so and does not fill with liquid (the vinegar). While it is still warm, pot into hot sterilised jars , filling to within 10 milimetres of the top. Cover with a waxed disc and seal with a vinegar-proof lid. Leave to cool entirely before labelling. This chutney needs to mature for at least 3 months before eating. Trying to show you when the chutney is ready for potting but the steam kept getting in the way!